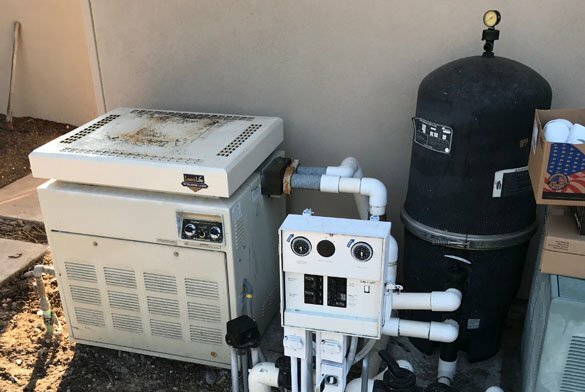 This ProTouch Pool Services customer in Carlsbad, CA was wanting to do a complete pool equipment upgrade to simplify the usage of his pool and spa. That consisted of replacing the pool heater, pool pump, filter and adding complete pool automation. This new controller will allow the customer to turn anything on or off with the push of a button on his new wireless remote control. When it comes to pool heater installation, we usually lean towards a Raypak pool heater. Not that we dislike others, we just see great performance and longevity of these heaters in the field. It sometimes comes down to the area the pool heater is getting installed at based on space and access. 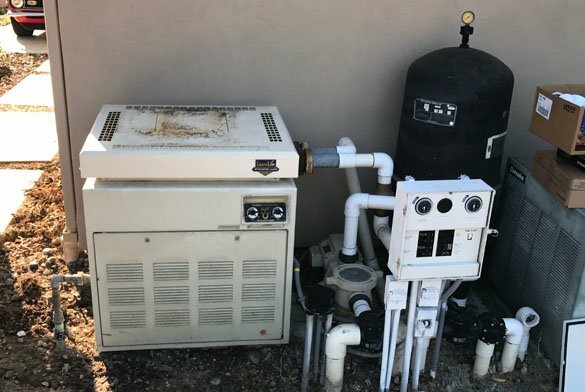 This specific pool heater installation was with a Raypak 406A natural gas pool heater. 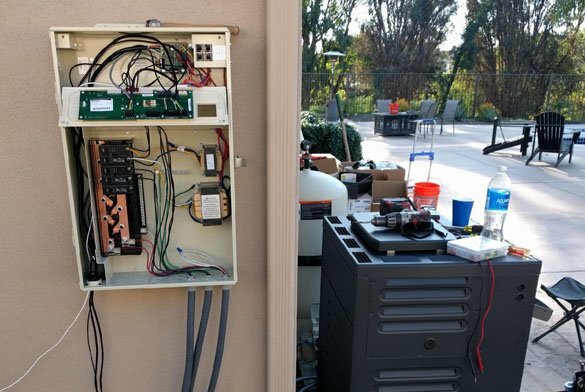 To control the entire swimming pool and spa with his new wireless EasyTouch remote or via smart phone and computer with the ScreenLogic bundle, we installed a Pentair EasyTouch 4. 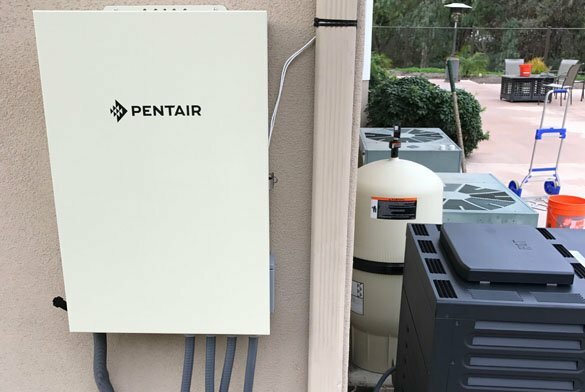 This Pentair pool automation also included Pentairs IC40 salter water chlorine system. Salt water swimming pools help prevent spikes in sanitizing and make the water much softer as long as your pool water chemistry is in proper balance. 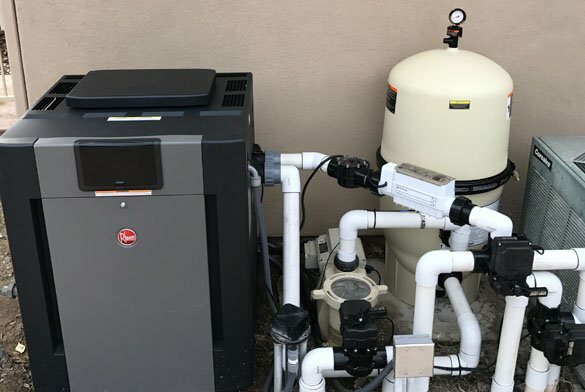 For pool filtration, we installed a Pentair Clean & Clear 420 sq ft cartridge filter as they have a higher flow rate, can go longer between filter cleaning (sometimes) and are much easier to clean (for the homeowner or the pool service provider and leaves much less debris. D.E. pool filters use a product that is very messy and they are more difficult for homeowners to clean. 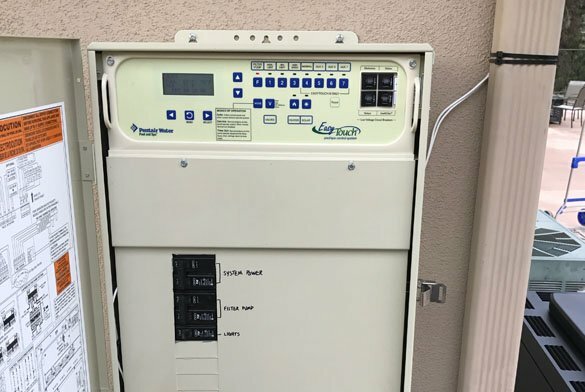 The Jandy three way valves and the Pentair pool actuator are to change the flow between your pool or spa, turn on or off your fountain or water feature and turn on and off your pol solar. This project was in Carlsbad,CA, 92009 though we do offer this equipment installation throughout San Diego County.